Keryi.Can.Boleh: Rocking those Satin Pants! This one will be a short outfit post. Today's main super star----Satin Pants! I wonder why that is the mindset about satin like pants? Here, I paired my pants with a turtleneck knited strip top. Love this strip top cuz somehow it has the slim illusion (illusion only la..sadly *cries* ) unlike the usual horizontal strip top where it widens your whole body. Noticed the folds at the bottom of my pants??? Ahh..You probably can't see it that well cuz it's black but i folded it up to just above my ankles. Instant change from working boring black pants to casual smooth satin pants! Yay! Experiment the length of the folds by adjusting the width of your folds. Paired the outfit with my spike shoes to save it from not being tooo overly formal. Paired my pants with a chiffon top as the material is soft, it can match well with the satin material. Casual day out--- Chiffon tops are great to endure our super hot Malaysian weather! Want comfort---Slippers are the way to go baby! 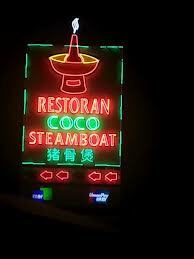 Ohhhh Yaaaa... And i ate at Coco Steamboat for the 1st time and it was Awesome! Means we are coming back! Yay!